Drawing strength from our heritage of quality and reliability, we produce globally competitive food products in the most sustainable way possible. As a leading global food company, we are passionate about cultivating good food for a better life by bringing high-quality, healthy and nutritious food to our consumers. Our brands are some of the best known and most trusted in the marketplace today. It is our commitment to ensure we maintain and keep this trust. We produce globally competitive food products in the safest way possible. The Group has comprehensive quality and food safety policies that ensure its products are of the highest quality and meet the strictest food safety standards. The Group’s food safety policies ensure that consumers understand our commitment to providing food products that conform to food safety standards, and to regulatory requirements through a food safety management system. We require our toll manufacturers to adhere to the same commitment in delivering our products to market. Preventive Controls Qualified Individual (PCQI) certificates are given to all facility managers in the US as part of the Food Safety Modernisation Act. Facility managers of DMPI-owned and Toll Manufacturing facilities exporting to the US also have PCQI certificates. Our agro-industrial processes are accredited by the world’s leading food certifying bodies, Global Food Safety Initiative (GFSI) or British Retail Consortium (BRC), with 88 quality audits across our production facilities and toll manufacturers in the United States, and 24 audits in the Philippines. The audits were performed during the year by reputable, independent international auditors, business partners and customers. Audit results confirm that our processes meet or exceed standards for the supply and export of food products to certain countries. 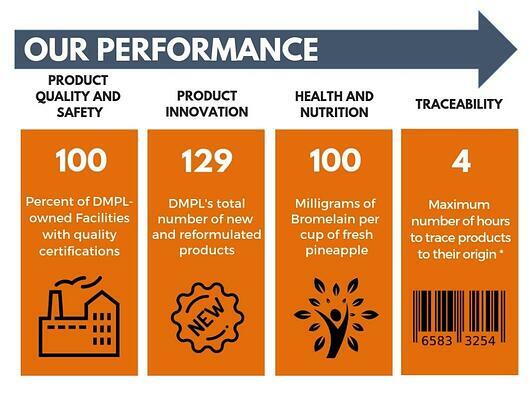 Del Monte Philippines’ Quality Policy is committed to Total Customer Satisfaction in providing food products that meet the highest global standards in quality, food safety, hygiene and service. Our operations in the Philippines have elevated the bar on quality manufacturing with its Food Safety Systems Certification (FSSC) from Société Générale de Surveillance Philippines in all our manufacturing facilities. The Toll Manufacturers’ Quality Management Programmes plan includes FSSC 22000 certification for all our manufacturing facilities. This is to ensure that all Del Monte products, whether produced in-house or by our toll manufacturers, are safe and of highest quality. The key requirement for marketing our products worldwide, GFSI and FSSC, incorporate key systems – International Standards Organisation (ISO), Hazard Analysis and Critical Control Points (HACCP), Good Manufacturing Practice (GMP) standards - into a single system. 1. In the US, continuous improvement of our quality system is driven through management review, quality planning and quality improvement teams. 2. DMFI built a multi-layered quality system protocol that starts with our executive leadership establishing the Company’s quality protocol which is deployed to each of our facilities to provide guidance and direction, which is further supported by our manufacturing site procedures. 3. At our PET Plant in the Philippines, our plan is to improve the GMP quality scorecard by closing out gaps via a monthly technical meeting with the building lessor for structural deficiencies, monthly waste walk for building facilities to update corrections and check the building condition, and conduct personnel refresher courses. 4. Our PET Plant also plans to revitalise food safety trainings especially Hygienic Engineering and strengthen food safety management systems. 5. 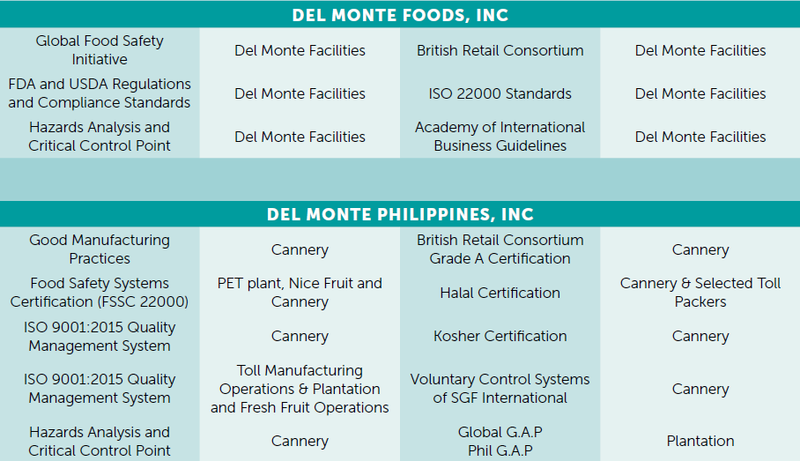 Del Monte in the Philippines regularly audits our toll manufacturers on compliance with our GMP, HACCP and Good Laboratory Practices (GLP) standards. 6. One of the major Key Performance Indicators (KPIs) of our toll manufacturers is the improvement of their Quality Scorecards year on year. 7. Our Toll Pack team strives to reduce consumer complaints by involving our toll manufacturers in the resolution of issues and improvement of our processes to eliminate sources of defects and potential complaints. Innovation is at the heart of being able to nourish families with delicious food and beverages. It is our hope that, by doing so, we are able to enrich lives every day. Significant strides have been made in introducing new, healthy, more convenient and environment-friendly products to consumers. We take a leadership role in meeting consumer preferences. Consumers are becoming increasingly interested in learning about the ingredients in their food and are often looking for positive health properties of low-fat or low-sugar. This emphasis on health impacts and benefits has ongoing implications for product design and sourcing. The Group is committed to product innovation in coming up with new and reformulated products based on consumer trends and changing preferences to healthy and nutritious food products. 1. In the US, Del Monte invested US$1.8 million on research and development spend on innovation. 2. DMFI developed a set of guidelines that outlines the standards in developing new products which are applied to all new products and reformulation of current products. The guidelines are based on the latest USDA and FDA regulations along with insights from current scientific literature. These are updated as necessary with new findings. 3. One of our new products in 2017 was Del Monte Fruit Refreshers which won “Product of the Year” in the Healthy Snacking Category based on market research company Kantar TNS’ 40,000-consumer votes on product innovation. 4. Del Monte Fruit Refreshers was based on the Company’s research which showed that adults were looking for snacks in larger sizes and new exciting flavours. We came up with larger fruit cup snacks, paired with citrus and tropical flavours in water and had 100 or fewer calories. 5. In the Philippines, Del Monte Fit ‘n Right widened its product range by introducing the Del Monte Fit ‘n Right Active Isotonic Drink with L-Carnitine to replenish body fluids during exercise or intense workout as well as help reduce body fat. 6. Other products in the beverage portfolio include Del Monte Juice and Chews, a snack-in-a-drink combining nata and pineapple with fruit juice blends, a drink popular amongst teens. 7. The Group’s Nice Fruit joint venture in frozen pineapple successfully launched frozen pineapple spears in Japan last June. These are produced in Bukidnon, Philippines. Individually packaged and known as Pineapple Stick, it is available in about 70% of 7-Eleven outlets or about 14,000 stores in Japan. It is positioned as an on-the-go healthy snack placed in the store’s chiller section, and has received good feedback. With the Nice Fruit revolutionary technology, frozen pineapple, when thawed, has the same physical properties as fresh cut pineapple. 8. 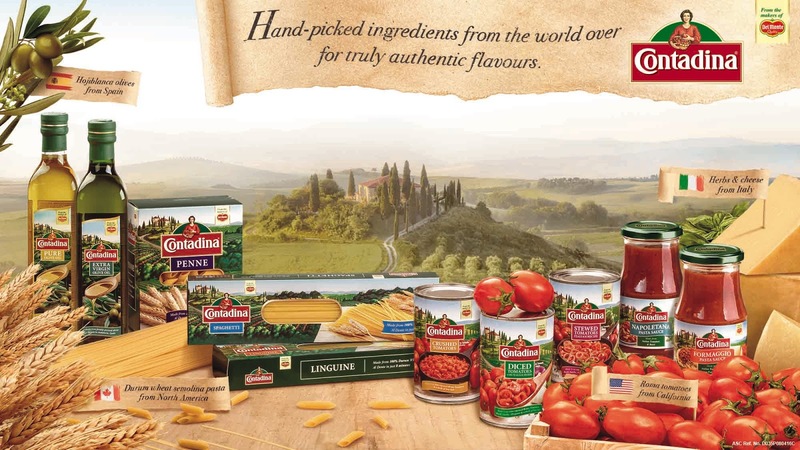 For the culinary portfolio, we launched the Contadina line consisting of olive oil, pasta, sauces and packaged tomatoes. We are committed to health and nutrition and consumers trust our brands. We actively work to ensure that our brands maintain this trust from one generation to the next. We encourage consumers to contact us with any concerns about our products. We always consider ways to improve our products and customer service. Consumers can be assured that their feedback will be shared with key decision makers. 1. In the US, Del Monte is the first major US food producer to voluntarily adopt nutritional labeling on all food products. 2. Our analysis shows that almost all of our products contain positive nutrients and majority are considered healthy. The Company will continue to improve to increase the number of its healthy products. 3. We aim to have a good number of our products in the US provide at least half a cup of fruits or vegetables per serving, and to meet healthy nutrient levels as recommended by the FDA. The majority of our produce are picked and packed on the same day – 97% of it without preservatives. 4. The majority of our products in the US are low in fat and we carry several specialised product lines: organic, low-salt and reduced-salt, no sugar added and light-in-calories for those seeking additional health benefits or following specific dietary regimes. 5. Within our existing categories, Del Monte has more No Sugar Added fruit products, No Salt Added and Reduced Sodium vegetable products than other branded players in the United States. 6. We are recognised as a Produce for Better Health Foundation (PBH) Role Model - PBH’s highest recognition level awarded to companies which provide significant steps toward improving the health of Americans. We are also a national partner of the United States Department of Agriculture’s “Choose My Plate” initiative and a member of the Tomato Wellness Council. 7. In the US, we began the process of verifying non-genetically modified organisms (GMO) ingredients from suppliers and sourcing replacement non-GMO ingredients where necessary. 8. Starting with the Company’s fresh pack production in 2016, all Del Monte tomato products as well as nearly 100% of Del Monte fruit and vegetable products have been converted to non-Bisphenol A (BPA) linings. 9. Since 2017, all added ingredients in all Del Monte vegetables, single-serve fruit snacks and most tomato products have been non-GMO, representing a majority of its product line (154 products in total). 10. In Asia, our nutrition platforms are anchored on weight management, heart health and bone health which give support to the immune system and aid in healthy digestion. Consumers today are increasingly concerned about the origins of their food. They want to understand the origin, safety, ingredients and sustainability of their products in simple language. Events relating to food contamination globally have raised consumer awareness and demand for better food quality and transparency, especially amongst millennials. In light of this, we aim to communicate with our consumers effectively to maintain their trust and ensure the quality and safety of our products. Part of our commitment to ensure that our products are safe is having a robust traceability programme in place for the Group. With globalisation, our products reach more consumers. In order to protect consumers’ health, the traceability programme allows us to quickly identify the origin of the product should an event arise - from its source and production to retailer. With this knowledge, we are equipped to handle consumer questions with confidence and in a timely manner. Having a reliable traceability programme enables the Group to have an effective and efficient process to identify a defective product or component and to execute the recall process if warranted. 1. The Group conducts periodic quality audits with our co-manufacturers to ensure compliance with our standards. 2. The number of assessments conducted annually for traceability is two mock recalls per facility (10 facilities in the US). We abide by the federal food safety requirements by maintaining a product traceability programme that allows us to track products shipped to our customers. 3. We have significantly enhanced this traceability programme to allow faster and more accurate traceability using electronic tracking of product movement. 4. DMFI conducts extensive Risk Assessment/Hazard Analysis and incorporates actions to assure that the products and ingredients meet the highest Del Monte standards prior to introduction in the marketplace. 5. The system is tested frequently and test results are used to drive continuous process improvements. 6. Del Monte also maintains records that allow the Company to determine the source of the ingredients used in its products. 7. In the Philippines, our standards to trace the products to its production date complies with the standards of the British Retail Consortium. 8. The standard applies to both our own facilities and our toll manufacturers. 9. Traceability assessments are conducted during certification and customer audits of our facility as well as our toll manufacturers. Our Group understands the need to have a packaging that protects our product, attracts consumers, is convenient to use, and strives to make a positive influence on the environment. We believe more efforts need to be exerted to ensure we maintain the quality and safety of our products as well as regulate our environmental impact. It gives us double incentive to rework our product packaging in a more environment-friendly manner. Our goal is to ensure the safety of our products as we nourish consumers, enrich lives, every day. 1. DMFI provides information about GMOs in our products to consumers so that they can make informed choices. The Company provides a hotline in the DMFI website to enable customers to ask detailed questions and provide feedback on the products. 2. While the fruits, vegetables and tomatoes in Del Monte products in the US have always been non-GMO, some added ingredients for sweeteners or flavourings have traditionally been sourced from genetically modified crops like corn or soybean. 3. In 2016, we began labeling most of our vegetables, fruit cup snacks and many more tomato products as non-GMO. 4. DMFI was the first manufacturer to work with the USDA for non-GMO verification for corn products to assure consumers about our sweet corn products. 5. We converted our products in the US to be non-BPA. We have converted 100% of our branded tomato products and nearly 100% of our branded fruit and vegetable products to have non-BPA lining. 6. The alternative lining material for our vegetable and fruit products is a polyester material, while the alternative used for our tomato cans is a vinyl lining. The linings comply with all FDA and European Food Safety Authority standards. The coating components are also compliant with the United States Environmental Protection Agency and Regulation for Registration, Evaluation, Authorisation, and Restriction of Chemicals. The new linings meet the requirements of California’s Prop 65, ensuring that they do not contain phthalates or BPA. 7. In the Philippines, Del Monte has a convenient packaging for ketchups in Stand-up Pouches (SUP) with reclosable spout. 8. To make our products more accessible for consumers, we developed and introduced a low-cash outlay pack in SUP for our tomato and pineapple tidbits products. 9. Del Monte in the Philippines is 100% BPA-Non Intent for all packaging materials in the cannery and its toll packers. 10. We also innovated our packaging to make it more convenient for consumers. Our juices now come in resealable one litre-cartons.